We are currently in Tucson for the winter and you would think the weather would be warm and balmy, but the desert is surprisingly cold. Especially at night. 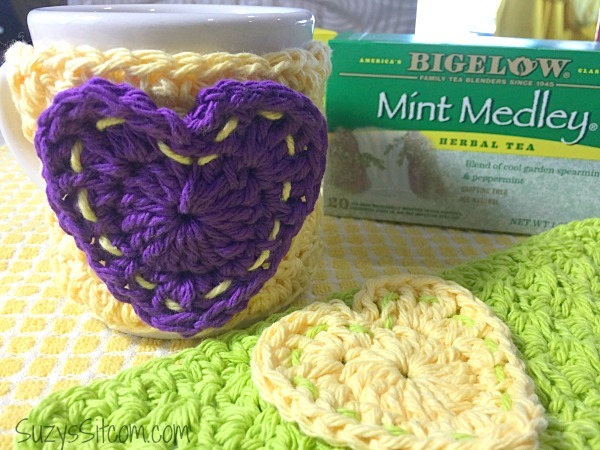 We have found that the best way to take away a chill is to grab a warm mug of Bigelow Tea. 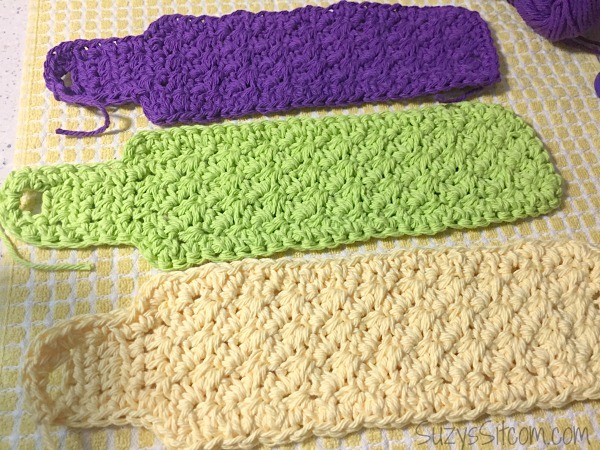 Oh, and your crochet hook! 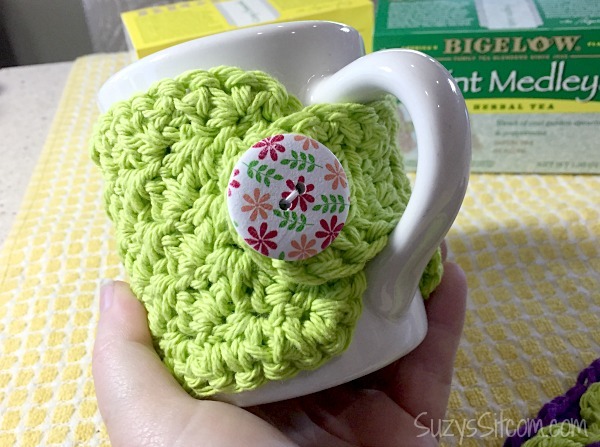 This week, I created a crocheted mug warmer pattern that I would love to share with you! 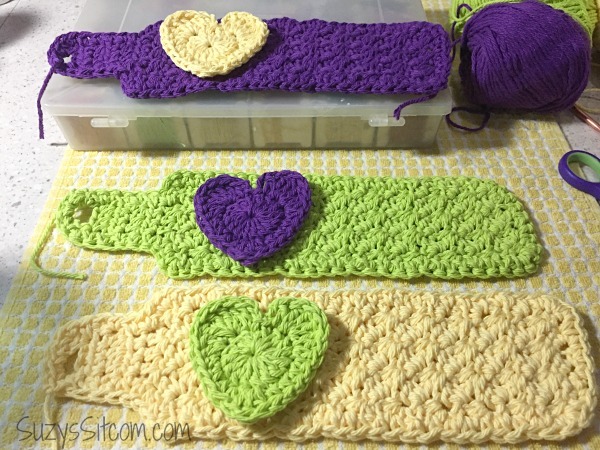 This is a fun afternoon project that makes a great gift! Or keep one for yourself for a well dressed mug! Cold weather means that I love to come home to a warm cup of tea. Drinking tea is not only warm and cozy, but it soothes the soul, invites conversation and makes memories. 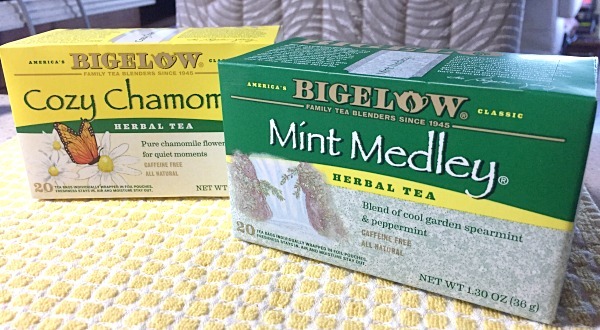 In our home, we Tea Proudly and enjoy the wonderful selection of Bigelow Tea. Be sure to check out the bottom of this post for an opportunity to win in the Bigelow Sweepstakes! 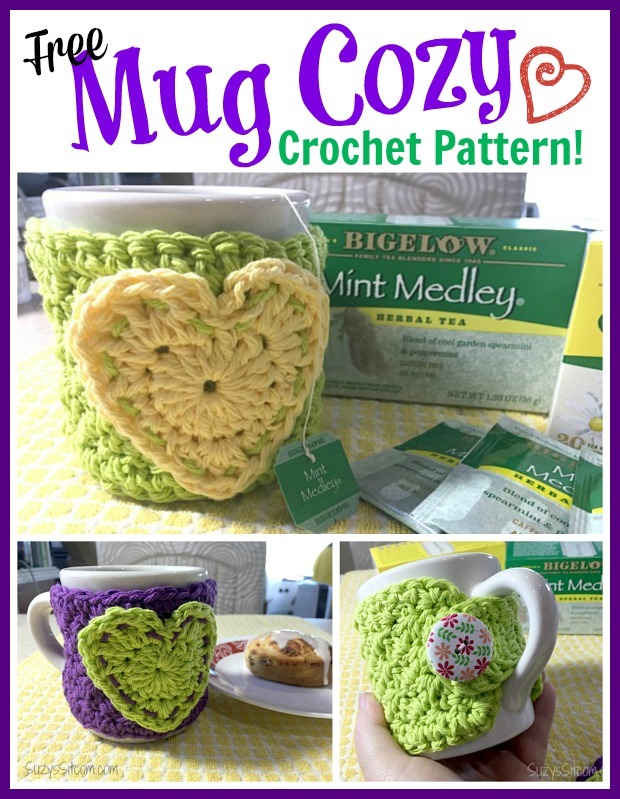 With tea as the inspiration, I created a free mug cozy crochet pattern. After all, its the least I could do for my plain old tea mug. Wouldn’t you say? Row 1: 1 sc, 1 dc in 2nd ch from hook, *sk next stitch, 1 sc, 1 dc in next stitch, repeat from * to end of row, ch1, turn. Row 2: *sk next stitch, 1 sc, 1 dc in next stitch, repeat from * to end of row, ch 1, turn. Row 3: Repeat round 2 until project measures 8″ long. Next row: Skip 1st stitch, sl st in next 2 stitches, 1 hdc in next 4 stitches, turn, ch 1. Repeat this row for 2 inches. 1 hdc in 1st stitch, ch 2, sk next 2 stitches, 1 hdc in last stitch. Work a sc border around the entire piece, with 3 sc in corners and 2sc into the ch 2 button space. Round 1: Chain 2, 15 dc into 2nd chain from hook, sl st into top of first dc. Round 2: Chain 2, 1 dc into same stitch, 4 trc into next stitch, 2 dc into next stitch, 1 hdc into each of next four stitches. 1 dc, 1 trc, 1 dc into next stitch. 1 hdc into each of next four stitches, 2 dc into next stitch, 4 trc into next stitch, 1 dc into next stitch, chain 2, sl st into same stitch. 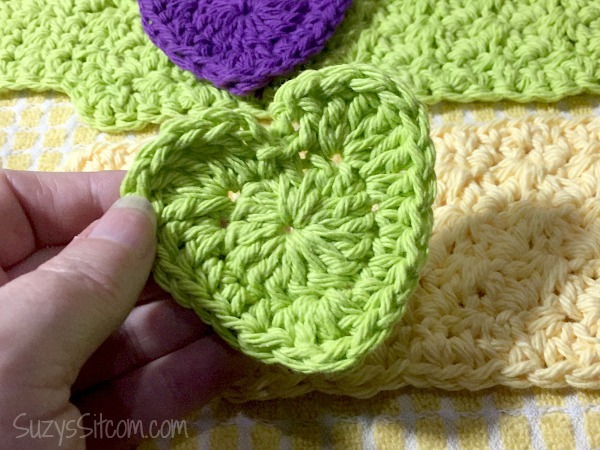 Use a straight stitch and same color yarn as the cozy to sew the heart onto the cozy. You can sew the heart anywhere. I chose just left of center. Tie off and weave in end. 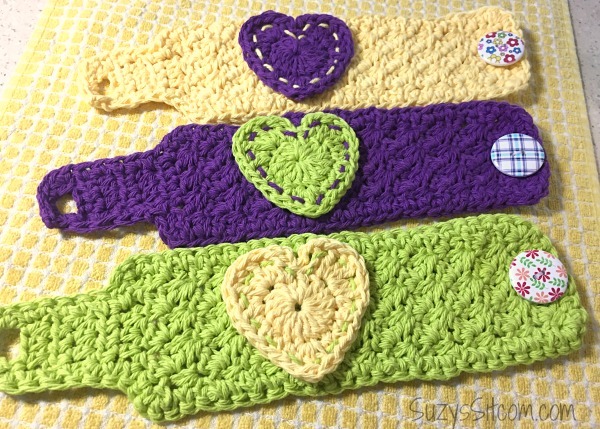 Sew button onto the end of the cozy as shown. 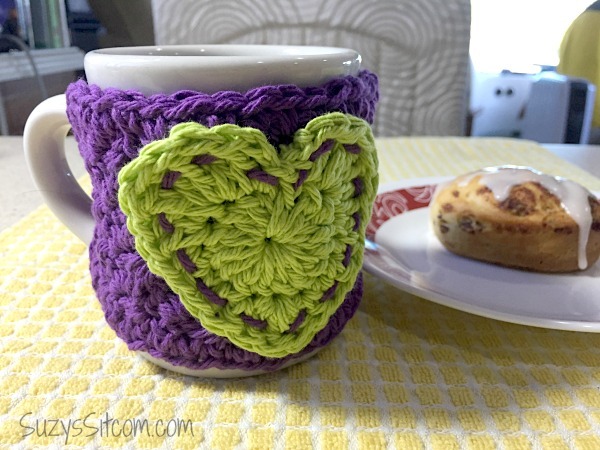 It is so easy to slip this mug cozy onto any mug, button it and suddenly you have a colorful cozy mug! Want to Tea Proudly at your home this wintery season? 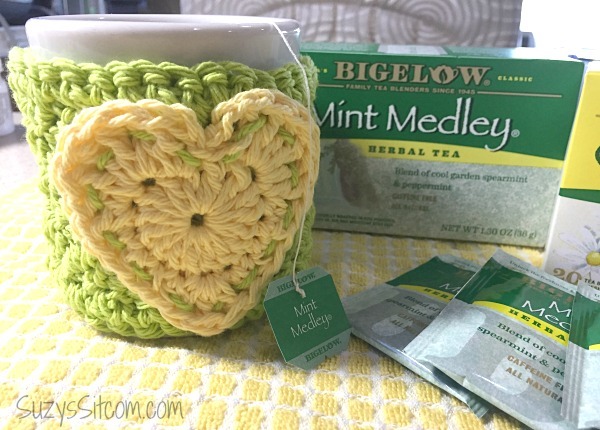 Bigelow Tea offers lots of great flavor selections including Green Tea, Constant Comment, Vanilla Chai, Cozy Chamomile, Peppermint, Mint Medley, and much more! Tea is second only to water as the most widely consumed beverage in the world; 82% of Americans drink tea—that’s more than 158 million people who count tea as a top beverage choice. Tea is now considered trendy- 42 percent of Americans under age 30 prefer to drink tea, and 27 percent drink tea exclusively. Millions of us around the U.S., all ages, men and women, share the love of tea in common. Historically, while tea holds a special place in many cultures near and far, today we can consider tea drinking a proud American tradition! In our home, we choose Bigelow Tea. We love the quality, the foil packaging, freshness, quality tea and quality ingredients. Do you love tea too? 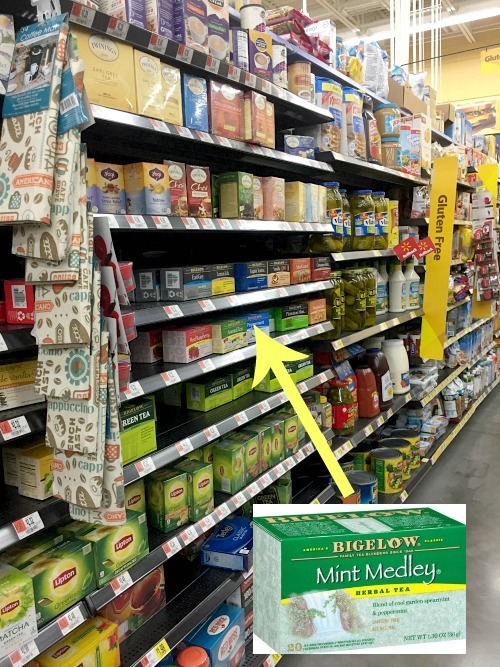 Bigelow Tea can be found at your local Walmart! Bigelow Tea would love to hear from you about why you #TeaProudly, and why tea is your beverage of choice. We are building a Tea Proudly community. What makes tea special to you? Next post: Quilt Pattern Series: Words to Live By- FAMILY! 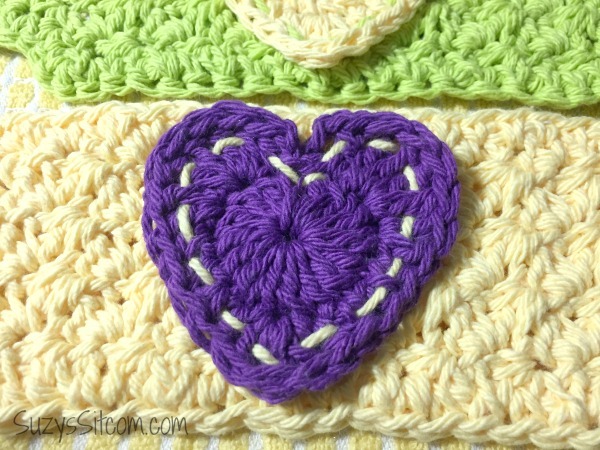 Previous post: 10 Free Knitting and Crochet Patterns!